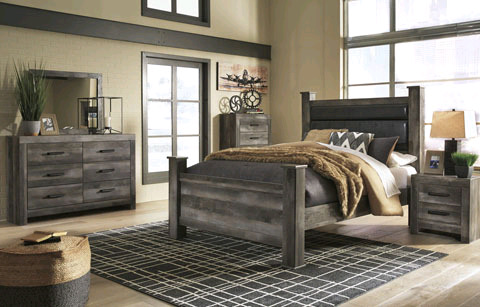 Rustic gray planked replicated oak grain with authentic touch. Large scaled dark colored hooded pull. Sticks across headboard give a thick planked look. Side roller glides for smooth operating drawers. Cases feature a framed front and pilasters. Large drawers provide ample storage space. Slim profile dual USB charger located on the back of the night stand tops. Queen 67 and king 68 poster headboards feature an upholstered panel with horizontal channel details. King poster bed requires the use of the king poster headboard posts 62. Large scaled bed option 54, 56, 57, 58 with a cross-buck design. The queen 98 rails work with both 64, 54 footboards. The king 99 rails work with both 66, 56 footboards.